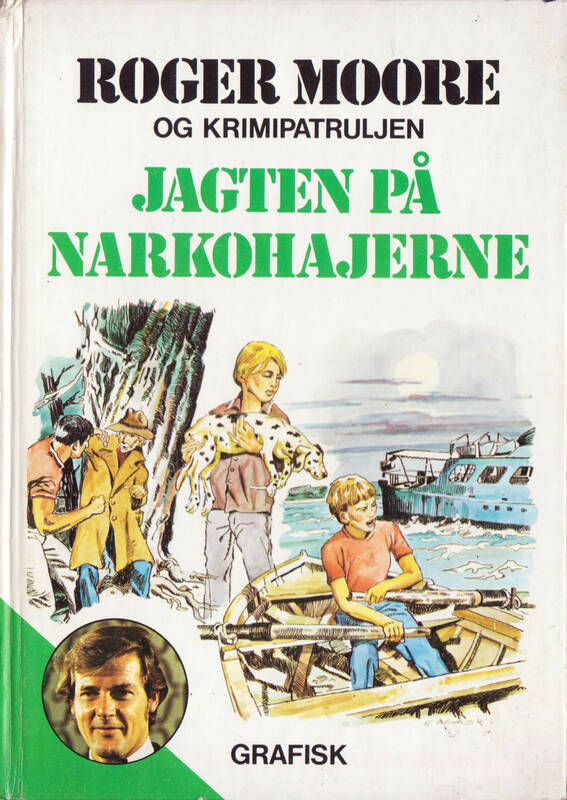 "Roger Moore and the Crimefighters"
This is the original Danish press book for "Tomorrow Never Dies" (EON Productions 1997), issued by the film's local distributor United International Pictures (formerly United Artists). 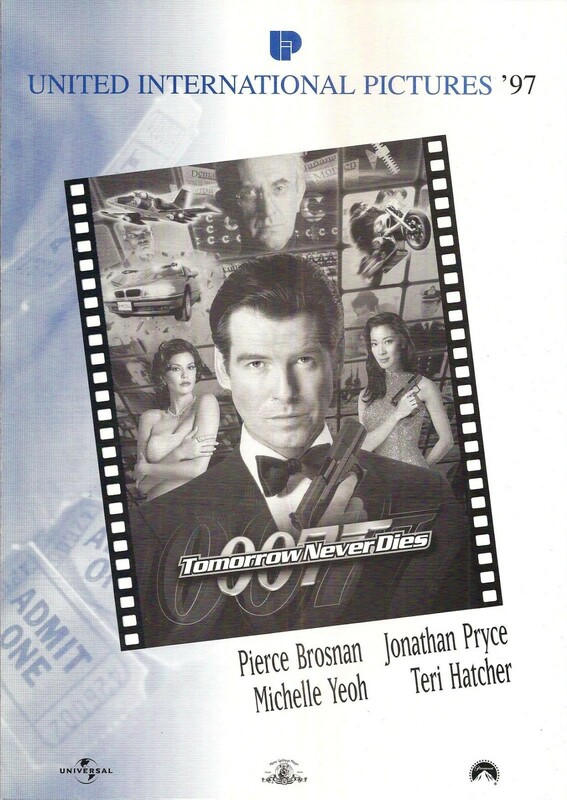 The four-page A4 publication was distributed to cinema owners and press in Denmark to mark the film's theatrical release in December 1997. 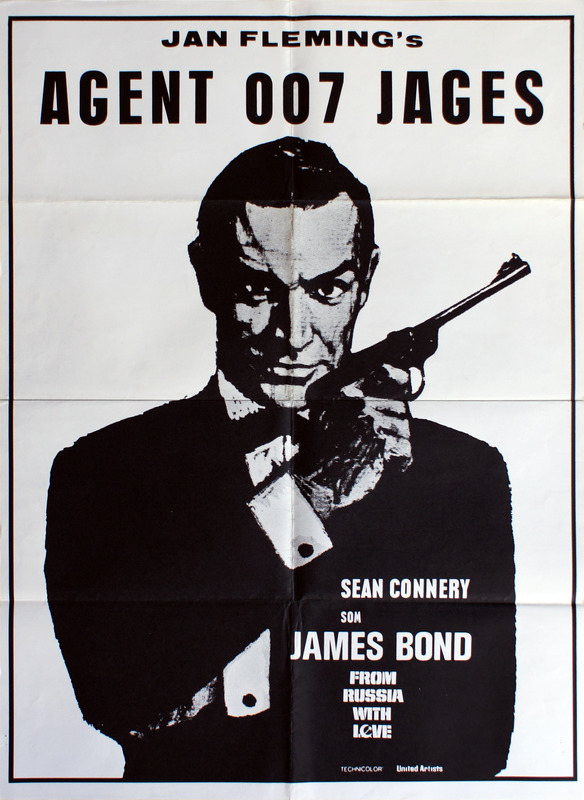 "From Russia with Love", the second James Bond 007 film from EON Productions, was released into Danish cinemas on 20 December 1963 by United Artists. This striking monochrome theatrical poster was based on Renato Fratini's artwork for the UK Double Crown poster, in turn based on a promotional photo by David Hurn. 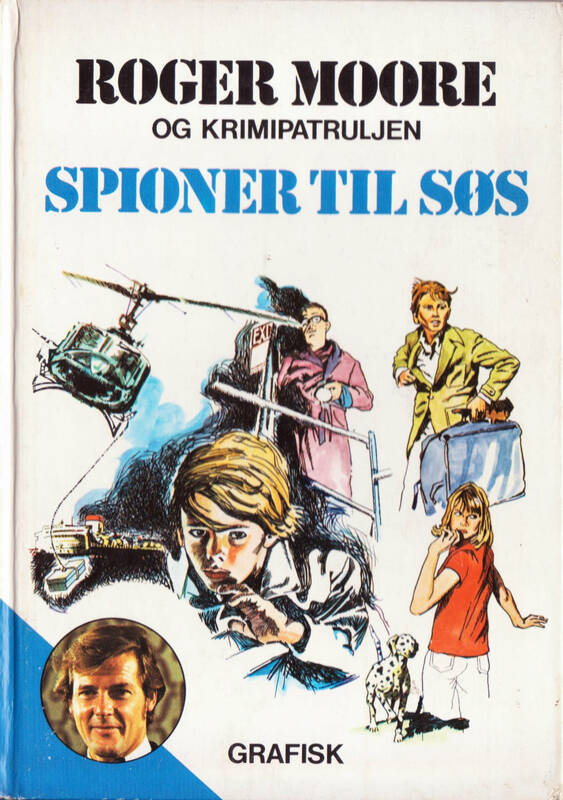 The name of the original Bond novelist, Ian Fleming, has been danicized into Jan Fleming in concordance with the spelling on the books' first editions in Denmark. 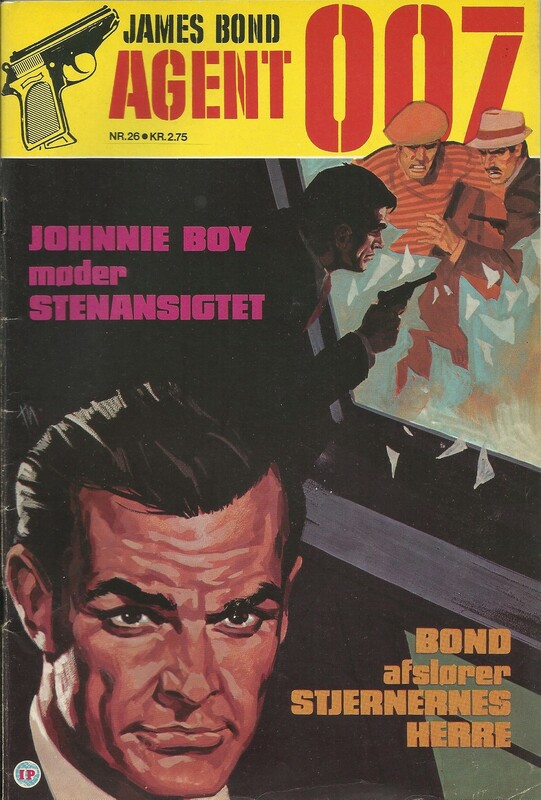 The film's Danish title, "Agent 007 jages", translates as "Agent 007 is being hunted". On Friday 07.07.2017, Tivoli Copenhagen Phil performs "The Hunt for 007 - an Evening with James Bond" at Tivoli Concert Hall in Copenhagen. James Bond•O•Rama.dk attended the first rehearsal and interviewed the conductor, Adrian Prabava. The iconic date 07.07.2017 has inevitably given rise to several James Bond 007-themed events in Copenhagen. On this very Friday, Tivoli Concert Hall presents "The Hunt for 007 - an Evening with James Bond" as part of Tivoli's annual music festival SommerKlassisk. 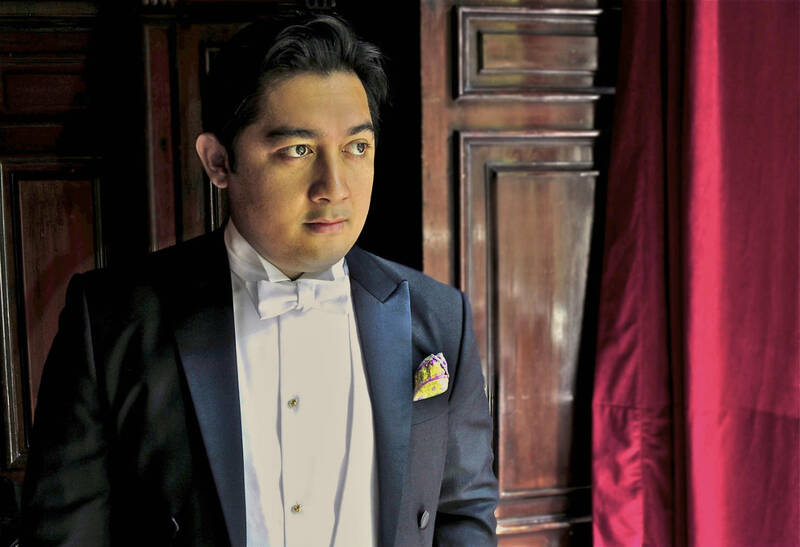 Indonesian-born German conductor Adrian Prabava will be conducting the Tivoli Copenhagen Phil (formerly known as Tivolis Symfoniorkester) in a full programme of music from the James Bond 007 films. The programme was provided by European FilmPhilharmonic Institute. At the initial rehearsal that James Bond•O•Rama.dk was invited to on Tuesday 4th July, The Tivoli Ensemble and vocalist Pernille Rosendahl were not yet in attendance. The Tivoli Ensemble will support the orchestra with drums and electric instruments at the concert; they might also fill in the iconic guitar riff (if Prabava so chooses) during the "James Bond Theme". Rosendahl, who is slated to sing four songs, has previous Bond experience from her band Swan Lee whose single "Tomorrow Never Dies" in 1997 was a contender for the title theme in the eponymous film. During rehearsal, the conductor and the orchestra go through the entire programme for the first time. Prabava halts the music several times in order to fine-tune specific note lengths and polish any rough corners. Part of Michael Kamen's "Licence to Kill" score is repeated for string section only and then with strings and woodwinds until Prabava is satisfied with the result. It is like hearing the familiar 007 soundtracks being remixed and deconstructed live. The percussionist gets a proper workout during Thomas Newman's busy action cues from "Skyfall". Afterwards, Adrian Prabava describes this suite as the "most challenging" part of the programme. The orchestral sound will be overdubbed with live synthesized effects and timed exactly to the sound effects in the accompanying scenes from the film which will be shown on a screen behind the musicians. Furthermore, modern composing for films is generally more complex than in the 60s, says Adrian Prabava. "You can tell that film music has developed a lot the last ten years. Orchestral writing for cinema is getting more specialized, with greater possibilities of sampling and using the orchestra. There is kind of a new genre of composing for film, and this is also an aesthetic you can hear in "Skyfall"." "Nowadays, if I listen to contemporary pop music, many pieces don't have this depth of composition we used to have in pop music in the 60s. I'm talking about harmony, about rhythm. Very often is it reduced to a simple rhythm and bass, with a lot of repetition, less melody. This is the music of our time. So this is reflected in the movie compositions as well. Many people go home without being able to sing along to what they heard in the cinema, it's very rare now. I think there is a turning back, with musical films like "La La Land", this longing for the ... emancipation of melody, going back to the fullness, a full-bodied composition."